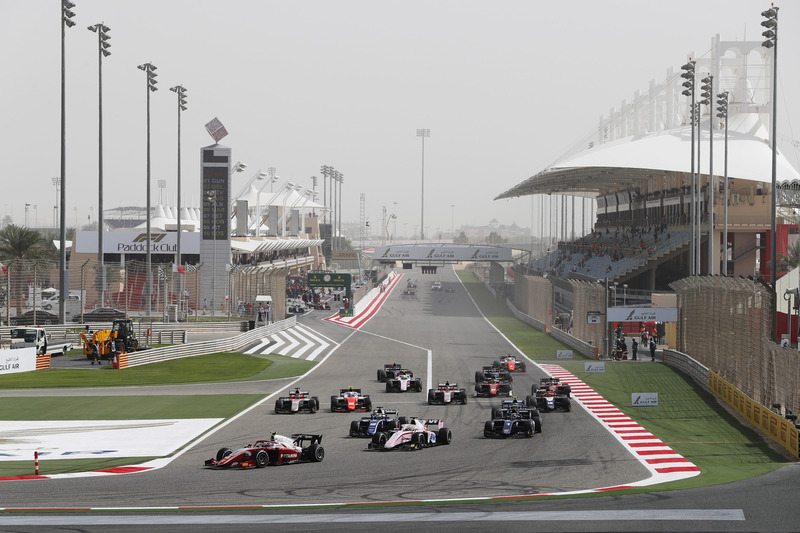 The 2018 Formula 2 championship kicked off in Bahrain this weekend, with a typically dramatic pair of races, giving us an insight into the brand new car and engine introduced this season, and our first chance to see how the 2018 grid stacks up against one another. In a turn of events that was unsurprising to some, but impressive nonetheless, F3 champion Lando Norris bagged pole position in only his second round of F2. 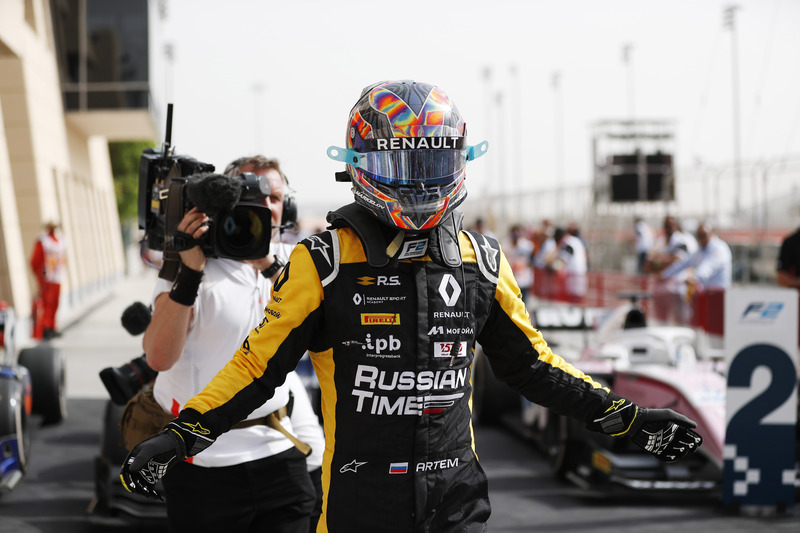 He narrowly beat fellow Brit and reigning GP3 champion George Russell, who edged out DAMS driver Alexander Albon who lined up third on the grid. Albon was only confirmed for the single round in Bahrain in a seemingly last minute deal, but his impressive performance out-qualifying his more experienced teammate by over half a second surely warrants another chance. 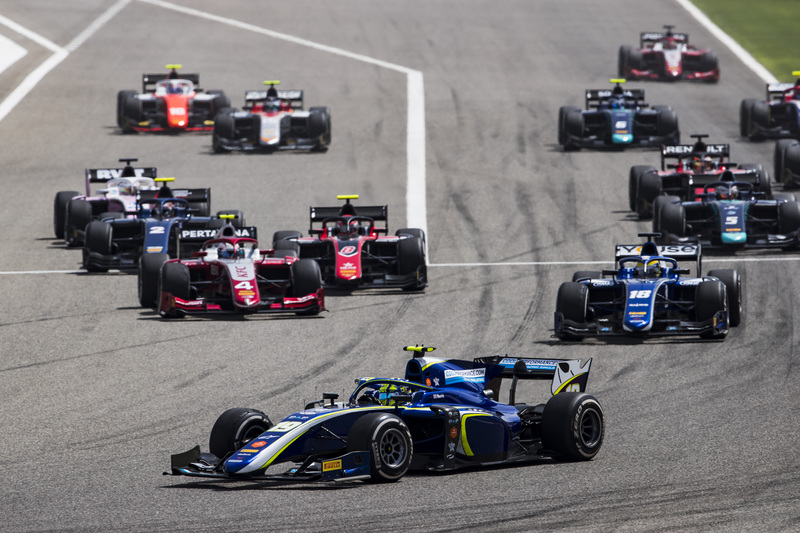 Albon’s teammate Canadian Nicholas Latifi was not the only experienced driver who had failed to put together a complete lap in Friday qualifying, title favourite and last year’s runner-up Artem Markelov could only do as well as seventeenth. Markelov’s weekend would only go from bad to worse when he lined up on the grid for the feature race on Saturday only to stall and be forced to start from the pit lane. He wasn’t the only one, with ex-Formula 1 driver Roberto Merhi also stalling, the first of several cases which prove that these new F2 cars are not the easiest machinery to get off the line. It was a dream start for Lando Norris with some lightning quick reactions to get himself off the line, something which he will take a lot of confidence in given the starts were one of his few weaknesses during his 2017 F3 campaign. By contrast, Russell was slow to get moving and even impeded Prema driver Nyck de Vries who was starting behind him. It was not the start he needed if he wanted to get one back against Norris. Albon also found trouble in getting his car moving, and the two of them lost several places in the opening seconds of the race. For Norris, from there it was a maturely handled race. His only hitch was a slow pit stop, but he had built himself a comfortable lead, so was able to retain this despite the hiccup. When the inevitable tyre degradation kicked in, as it always does around this track in the searing desert heat, he had enough of a cushion to be able to ease off slightly and bring his Carlin home safely. The dominant fashion in which he controlled the race was very reminiscent of some of current champion Charles Leclerc’s victories from last year. Behind him was a much more chaotic story. 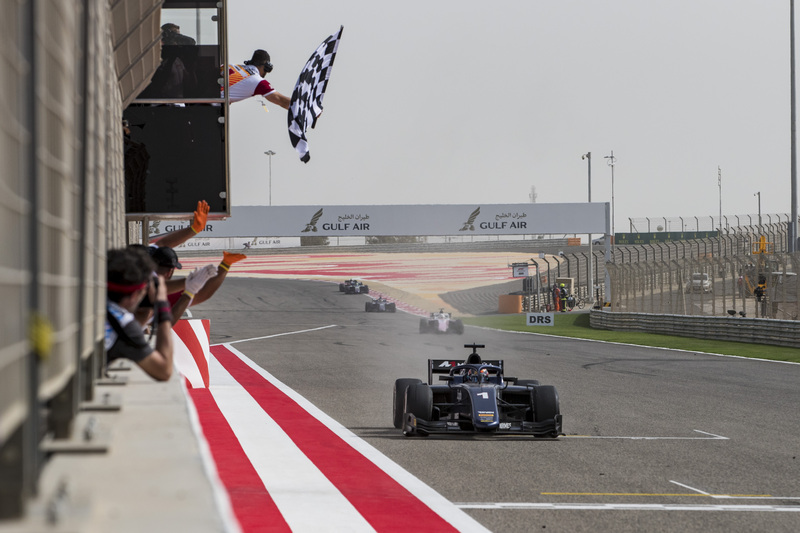 While it was Norris’ race to control, it was Markelov’s show to steal. Despite starting from the very back of the field he used his uncanny ability to manage his tyres to pull off a whole host of his usual opportunistic overtakes. The rest of the grid wouldn’t let him make it look easy however, and some of the newer arrivals proved that they could fight just as hard. There was a thrilling moment when the Russian driver, Maximilian Günther and Jack Aitken attempted to go three wide into turn 1. But it was Markelov who bested them all in the end, fighting through almost the whole field to finish a fantastic third place. After his poor start George Russell and ART attempted an undercut to gain some time back, and he did manage to finish in fifth in the end, but the tyre degradation was too great for him to gain any significant time back. This was the drawback of the Mercedes junior driver attempting to stop so early. 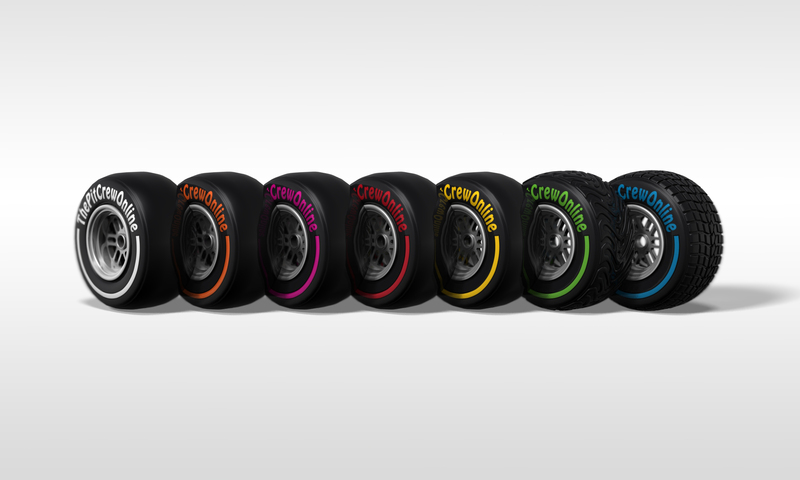 The Pirelli tyres run in Formula 2 are notoriously high degradation, especially on a track like Bahrain, and therefore usually difficult for rookie drivers to adapt to. It will not have been the result Russell was hoping for, especially after making his championship ambitions abundantly clear. 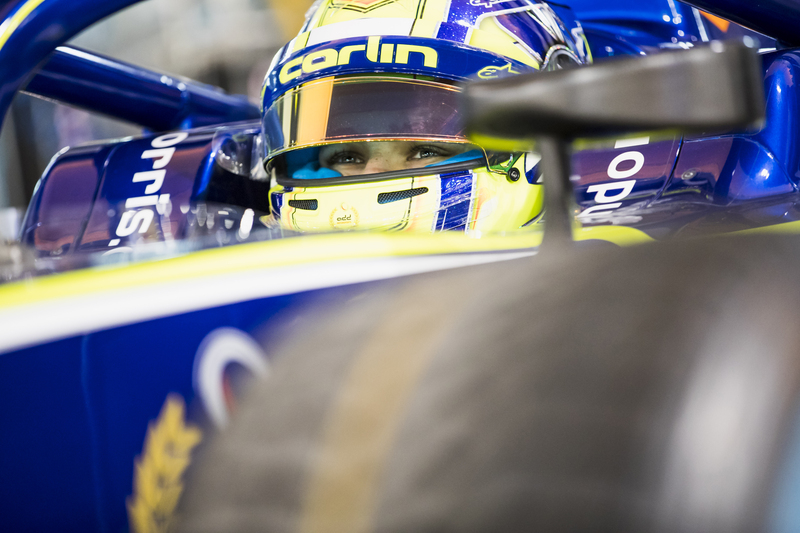 Carlin, a team returning after a year out in 2017, had one of the best results of the race. Alongside Norris’ win, Sergio Sette Câmara brought home a second place finish for the British team, giving them an impressive one-two on their return to the sport. The Brazilian driver was initially overtaken by de Vries in the early stages of the race, but ultimately managed to gain second place back. Where he really proved his worth was in his end of race scrap with Markelov as he fought to defend his second place from the charging Russian. They fought until the very last lap, but clever and aggressive defending was enough to for Câmara to maintain his position. Albon managed to recover after his poor start and intermittent DRS problems to a respectable fourth place, followed by Russell, and de Vries in sixth who could not find a way to manage his degrading tyres. 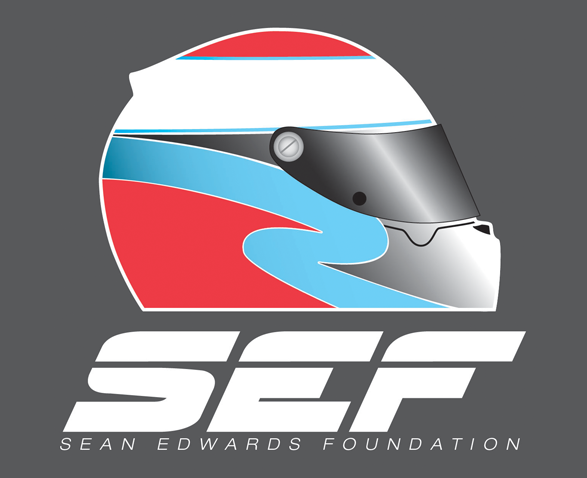 Sean Gelael, a much criticised and controversial driver, proved his stock by making a very impressive recovery from only qualifying nineteenth to finish seventh. It was rookie Maximilian Günther who finished in eighth to claim reverse grid pole for Sunday’s sprint race, while Jack Aitken and Ralph Boschung took the last points paying positions. In Sunday’s sprint race, there was yet more drama at the very beginning of the race. Gelael, with the potential for a solid result from his starting position of P2 stalled on the formation lap and was forced to start from the pit lane. There was just more trouble to come. Upon the race start three cars stalled again, failing to get off the grid entirely and they were pushed to the pit lane where they could join the race, albeit a way behind the pack. Two of the stallers were ART pair George Russell and Jack Aitken, with Haas junior driver Santino Ferrucci also failing to get away. Impressively, the other cars managed to avoid the stationary vehicles and everyone got away unscathed. The best start in this race was bagged by Nyck de Vries who was starting from third. He overtook pole sitter Günther to claim the lead of the race, while the young German was also overtaken by Markelov who had a storming start from sixth on the grid, the Carlin pair following him to slot into fourth and fifth. Everyone’s eyes were on tyre degradation throughout the 23 lap race. All drivers had started on the medium tyres, which in theory have long lasting wear. But ever year Formula 2 comes to Bahrain even the most experienced drivers find it difficult to make them last well. Many had speculated whether any of the drivers would attempt to do what Charles Leclerc did last year in the sprint race but taking an unprecedented pit stop and using his fresher tyres to fight back to claim victory. A pit stop is not mandatory in a sprint race, and at almost any circuit other than Bahrain it would not even be considered during a sprint race. But Leclerc had proven last year that it could have its advantages. In the end it was Prema who attempted to repeat their exploits of the previous year when they pitted de Vries from the lead on lap nine. He had a sizeable lead of around three seconds, but it was very early in the race to expect him to make his new tyres last until the end. It could be argued that it was not a gamble for the win, but an attempt at damage control, as de Vries is not famed for strong tyre management. His stop meant that Markelov inherited the lead of the race, Günther moved up into second and Câmara took third. Câmara was under pressure from his teammate Norris for some time, but an engine misfire midway through the race sent the Mclaren reserve driver tumbling back a handful of places, and most likely cost him a potential podium. The best the youngest driver on the grid could do was fourth place. De Vries was rapid after his switch onto softer tyres, and for a while it looked as though he might be able to recover to the podium. But as the laps wore on, his tyres began to degrade again. He still managed to finish in fifth, which is arguably better than he would have done had he not pitted. Ahead of him Markelov once again deployed his tyre management skills to hold a lead over Günther who was being put under pressure from the Carlin pair. The Arden driver was struggling to work out how to best manage his tyres, expected perhaps after he made the switch from Formula 3 where drivers are able to push their tyres a lot harder with a lot less degradation. But he showed great composure in holding off both Câmara and Norris, and by the end of the race he was even able to close the gap to Markelov in front. Behind the Carlin pair and de Vries in fifth, Luca Ghiotto made a quiet recovery from twelfth to finish sixth, while Ralph Boschung rounded off a solid double points scoring weekend by finishing seventh. Rookie and Honda junior driver Nirei Fukuzumi claimed the last point in eighth place. Norris leaves Bahrain as championship leader, and it was undoubtedly a dream start for the young Brit, as he certainly seemed to have the edge over many of the other rookies. At the moment it seems as though Markelov, who provided most of the thrills of the weekend, is his closest competitor. This should be expected from a driver entering his fifth season at this level, but that is not to take away from the skill and speed he displayed this weekend. Günther is perhaps a surprise as the second rookie in the standings at the moment, taking the points over higher rated drivers like Russell, Aitken and Haas junior driver Arjun Maini. But his rivals would do well to remember that he was more than capable of taking the fight to Norris on his day during Formula 3 last year. Bahrain is a difficult track to open the season on, especially for those unused to the Pirelli tyres. And it is clear that teams are still trying to work out how to optimise the performance in these new cars, particularly in terms of start procedure. But after a calendar reshuffle this year, the next challenge Formula 2 faces are the streets of the Baku City Circuit, no mean feat given the utter madness it usually delivers.